1. Uniform and just prices based upon a sensible profit. 2. The sale of reliable pianos only. 3. The giving of a guarantee with each instrument that would absolutely insure the buyer. 4. The easiest possible terms of payment. 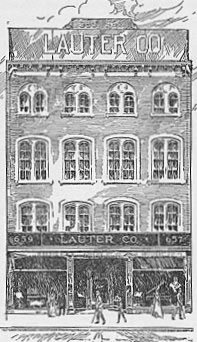 Upon the death of S. D. Lauter in 1885, Mr. Charles E. Cameron became the managing head of the business. It was at this point that the company went from a piano seller to a piano manufacturer and seller. A new factory for piano production was built at 58 - 68 Lackawanna Avenue, directly opposite the Lackawanna Railroad Station.